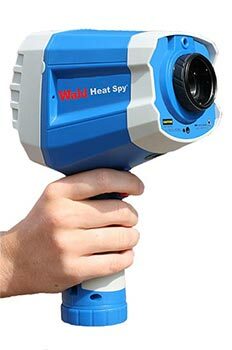 The z70 model includes a 384 x 288 array with 110,592 pixels - 44% more pixels than 320 x 240 thermal imagers with 76,800 pixels. Fully calibrated, high resolution camera captures clear, sharp images! Easily load images to an iPad® using an SD adapter. The thermal images can be imported and stored in the regular photo application found on the iPad®, or used with a picture application like iPhoto®. The images can then be shared with other applications on the iPad®, offering the flexibility of easy to prepare reports. Two temperature modes allow you to switch between the ranges of -4° to 356°F (-20° to 180°C) or 212° to 1112°F (100° to 600°C) to select the temperature range required for your application. Temperature readings are always accurate. Quick stabilization circuitry enables the camera to acclimate to sudden ambient temperature changes in just a few minutes, compared to 30 - 45 minutes with other cameras. Simultaneously captures both a thermal and visible light picture, or either individually, with one pull of the trigger. View or download images to included Wahl Report Writer software, or an iPad®, with selectable voice recording, up to 45 seconds per picture. Thermal line analysis allows the user to select a target of interest as a temperature reference point, and show a relative comparison as a percentage between the target temperature and the temperatures in the surrounding area. This enables the user to quickly find potential problem areas in need of further attention. The z70 frame rate is 30Hz. The a70 features a 9Hz frame rate for export without license restrictions.offering the flexibility of easy to prepare reports.